Get ready to challenge your friends on TT Isle of Man’s 9 fictional tracks. These are based on real life locations and will allow you to perfect your skills before facing the legendary Snaefell Mountain Course, while also offering a place to compete against up to 7 other players in the multiplayer mode. If you pre-order TT Isle of Man, you get the King of the Mountain DLC pack for free. Face the longest and most extreme course on earth with the Honda ‘TT Legends’ CBR1000RR Fireblade. Take to the mountain roads with this tribute to the Isle of Man legend, Joey Dunlop (26-time winner). The motorcycle was famously used in 2013, by the “Morecambe Missile” John McGuinness (23-time winner), to mark the 30 year anniversary of Joey Dunlop’s first victory with the Honda team. Now it’s your turn to surge to the top of the podium in these iconic red leathers and that unmistakable yellow helmet. TT Isle of Man will be available on March 6 for PlayStation 4, Xbox One, and on March 27 for PC. Pre-ordered Isle of Man TT for the XB1 last night. Can't remember the last time I was this jazzed for a new racing franchise to be released. This is fantastic,i have the PS2 game,i think it's called Suzuki alstare tt,that has the isle of man race in it,as soon as I get enough money this is a definite buy. Not here. Best Buy screwed me. I pre-ordered, and the game was supposed to be ready for pickup yesterday on release day. Got an email from Best Buy indicating the game wouldn't be in the store until Friday. The second time it has happened, both with obscure titles in niche genres. I bet my local Best Buy won't stock this game and probably just is having one sent to the store to cover my pre-order. Friday will be here soon enough. Great to hear. I'm not too concerned with lack of depth, as I'm such a MASSIVE fanatic of the real Isle of Man TT that I probably can take 100 laps of the full Snaefell Mountain course and not get bored. I'm one of those freaks who watches every second of all seven days of IOM TT coverage every late May and early June on Velocity. I also HIGHLY recommend finding the documentary "Closer to the Edge" about the IOM TT. Fantastic film. I finally lost patience with my Best Buy pre-order for Isle of Man TT: Ride on the Edge that still hasn't arrived, canceled it and bit the money bullet to pay full price at retail for this game last night at Gamestop. -- Sense of speed. The sense of speed in this game is INSANE. I don't know or care much about 30 vs. 60 FPS as long as the frame rate is consistent. I believe IoM runs at 30 FPS on the OG Xbox, but it's very steady -- and FAST. You must play this game in the helmet cam angle, or you're cheating yourself from a fantastic sensory experience. The last time I recall the landscape ripping past this quickly in a console motorcycle racing game was Moto Racer and Moto Racer 2 on the original PlayStation. -- Foliage. The foliage on the trees and meadows is very detailed, very lush. Really adds to the sense of immersion. -- Lighting. You can race in the morning, noon and afternoon, and the lighting varies realistically in all. It's really important to stay on top of the transition from sunshine to shade in some sections of the course, all of which is depicted beautifully. -- Force feedback. The force feedback in this game is excellent. Every gear shift is met with a tactile "clunk" in the controller. Every ripple and undulation in the Mountain course is felt in your hands. I wish there was a bit more of a tactile feel of breaking traction in the controller, but I'm also using medium assists, which could dampen the sensation of grip. -- Sound. I've only ridden a 600cc Supersport, but it sounds great. The bike overrevs and slams the limiter when you keep the throttle pinned and catch air over various crests on the Mountain circuit. -- Attention to detail. The detail in the 37-mile Snaefell Mountain course on the Isle of Man is astonishing. No repetitive cardboard cutout houses and structures here. Every building is true to life. Incredible. I only rode Snaefell so far. I have not done any of the fictitious tracks, which look fun. I only have ridden a 600cc Supersport, as I'm not ready to handle a 1000cc Superbike yet. Hell, I'm crashing between 15-20 times on one lap of the Mountain course even with all moderate assists on! This is not a forgiving game in terms of collision detection. I did try the bike without assists in the tutorial, and there's almost no question Isle of Man TT: Ride on the Edge will join DIRT Rally as the Dark Souls of console racing games if you want. It is BRUTALLY tough and unforgiving with all assists off. A real challenge. But thankfully the game gives you three or four levels of assist help in areas like traction control, wheelie control and more, with a full racing line provided. Trust me, you're going to need that help until you learn the circuits and bikes. Remember, the Mountain course is 2.5 times longer than the Nordschleife at the Nurburgring, the reference standard for insane, long car racing circuits. There also are three controller profile presets, but you also can customize the controller any way you want. Kudos, Kylotonn. My only quibble so far about the handling and physics is that the bikes seem to be a bit slow to respond to quick side-to-side movement. The bikes don't "pick up" from corners nearly as quickly as a MotoGP bike, but these are not prototype machines like GP bikes. They're all based on street models. And maybe reducing my need for assists will help the bikes react more quickly. Still, it's nothing I can't ride around right now. Not a show-stopper, by any means. If you're a fan of the Isle of Man TT like me, get this game NOW. Full stop. Supersport and Superbike machines, with sidecars coming in May as DLC. All of the top real riders, such as McGuinness, Dunlop, Hutchinson, Anstey, Hillier and more. Plus the re-creation of the Snaefell Mountain course is breathtaking. A big accomplishment in console racing games for which Kylotonn should be praised. This was a labor of love for the developers, and they didn't cut any corners. If you're a fan of motorcycle racing games, seriously consider getting this game now. It's mega fun. But understand it's not an arcade game, and it's a different kind of title. If you're a fan of "sim-cade" racing games but not necessarily bikes, maybe wait for a price drop before buying this game. It's VERY much a niche title, with the Isle of Man TT being the heart of the game. The TT style is more like rally than circuit racing, with riders leaving the line at 30-second intervals. You will pass and be passed by other bikes in the TT races, but it's not like a MotoGP race with five or 10 bikes near you wheel to wheel at all times. Isle of Man TT is more like a rally game in which the two biggest rivals are the clock and the circuit. The challenge for me is to reduce my accidents, slice my time and learn the Mountain circuit. That will provide me with more than enough "one more lap" challenge and fun for quite some time. Kylotonn Racing once again has put an ear lobe-to-ear lobe grin on my face for the second time in 12 months with Isle of Man TT, along with the vastly improved WRC 7 last year. There's no question Kylotonn has become a legitimate player along with Codemasters, Polyphony Digital, Turn 10, Kunos and the overrated Slightly Mad among the elite developers of console racing games. Feel free to reply with questions or comments. Thanks. UPDATE: This game does have mass start events for races, with customizable lap counts. I completely spaced on that, like an idiot. So you can have traditional rally-style TT format or mass start races like traditional racing. Once you get the feel of the handling of the bikes, the racing is INSANE, with a ridiculously fast sense of speed. This is the best bike racing game I've played since MotoGP and MotoGP 2 on the original Xbox in the 2003-04 era. ANOTHER UPDATE: I forgot to mention two points of note in my detailed analysis. One, the sound of the wind is so impressive in this game. It sounds like a gale when you top 170 mph or so. 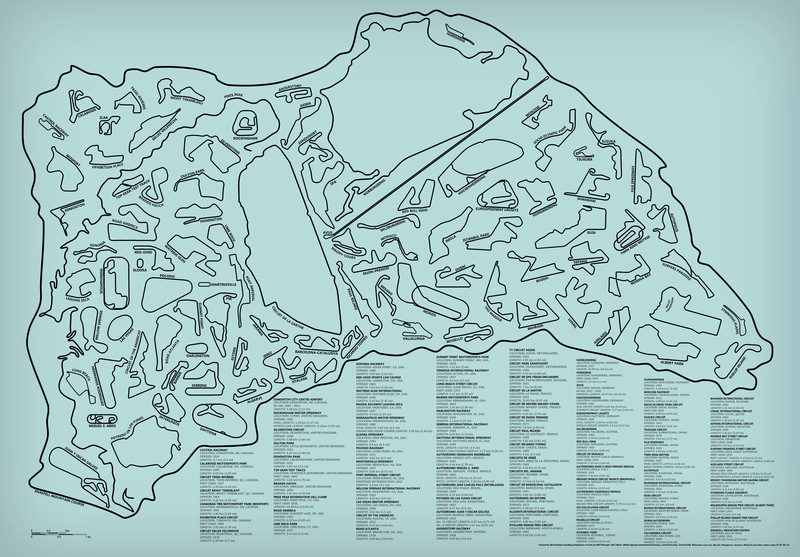 Check out this map: Look at all of the circuits around the world that can fit inside the 37-mile Snaefell Mountain course from the Isle of Man TT.